Queen Creek and its many volcanic towers is the home of central Arizona sport climbing and bouldering. The rock is volcanic tuff and the routes go from deep-pocket pulling down to tiny-edge crimping, depending on the area. Many of the routes here were established between the early '90s and present day. Queen Creek Canyon is found above the small town of Superior, AZ, about an hour's drive (depending where you start) east of the metro Phoenix area. Drive through Superior headed east, go up the hill and the various areas will be found after you get through the big tunnel. Phil Caballero bouldering at Queen Creek. can't remember the route name. 1) Enjoy it while we have it. 2) Remind the shafts and tools that the area still means a lot to a lot of folks. I'm not sure of the other areas, but Lower Devil's has seen quite a bit of activity lately. I've been in LD most weekends since December. Other parties have been there nearly every time. I have to agree that some of the routes, especially the earlier bolted routes, have runouts accepted by the original developers. Like me, we did a lot of ground up stuff first then evolved to create better sport routes via rappel. Newer routes with built in runouts for no apparent reason (like some in the Pond), bug me. I try to stay away and point out their shortcomings to good people. Some of the guys have gone back and changed the routes to bring them in closer to today's reality. Newer routes I've climbed have either been way over bolted or under. I think it's just hit or miss, you have to take responsibility for your climb and choose the right one or back off and TR it. I can comment on current bolt placement as I've been putting up routes of late (not posted yet, sorry). Many of the lines are indeed done ground up as that is the favored style from my perspective and I know Marcy and Geir feel similarly. When there's good gear placement I have not been placing a bolt, especially if the rock yields a hollow sound to a hammer blow. I feel that a bolt placed in such rock may give a climber a false sense of security, while a climb that requires gear placement is going to only attract climbers solid at the grade. The four Glitter Box long routes -- Adios Larry, Damsels in Distress, Summer Assault, and Two Bit Shuffle -- are a bit odd in this regard as they are mostly bolted, but not fully enough to be truly "sport", nor are the bolt placements only where absolutely necessary. In Lower Devil's Canyon there is now a new area. Just a heads up on the mining issues. Read an article Dec 7th local paper. Resolution Copper is prospecting the largest copper deposit known to mankind..literally. Queens Creek is sitting on top of it. Currently there is bill in Congress to do a landswap of US forest land (oak flats, road to LDC) for other land so they can start operations. The mine will be underground 1.5 miles, but the land will shift so they don't want anyone on top when it all collapses. They are in the processes of cajoling/bribing all parties to play the game and support the landswap. I read they promised climbers $50,000 to create new climbing areas. I sense the mine is letting climb on private property (The Pond), because they want us to support the deal. OPINION: In this day and age this new mine is a done deal. Try to get as much out of them as possible and move on. They are ready to negotiate now and after the bill passes congress we will be nobodies. No way!!! That is awful Arjun!! LOST: 1 pair of testarossas at the base of a 5.8 at the ponds in Queen Creek, AZ. Just a friendly comment/opinion about the parking at the Pond area. It is best (especially on a busy day) to angle your car toward the gully and park side by side as opposed to parking nose to bumper...the latter allows less cars. Think of it like you would in a parking lot as opposed to a Starbucks drive-thru line. 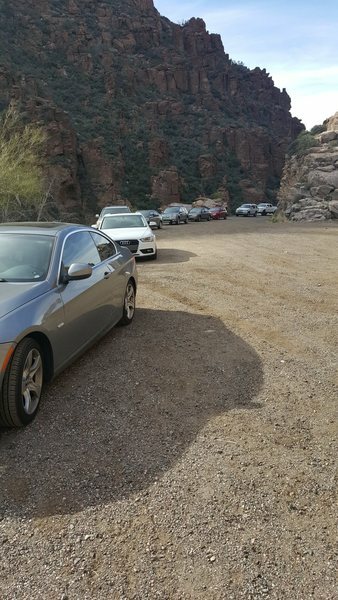 Normally the first 2-3 cars of the day help dictate the parking but in today's case I was the 9th in line and had no choice but to follow suite. Thanks! The incorrect way to park at the Pond parking lot. Just thought I'd pass along a thought about the routes in some older areas at Queen Creek. A lot of the bolts and hangers are not considered up to modern standards. Many old SMC hangers were used. If anyone wants to begin a rebolting effort, maybe you could contact the owners of Queen Creek climbing, the Queen Creek Coalition. They purport to represent climbing here so they should probably fix this problem.